LOS ANGELES (AP) There had been only one real practice, one small attempt at learning a couple plays with new teammates. 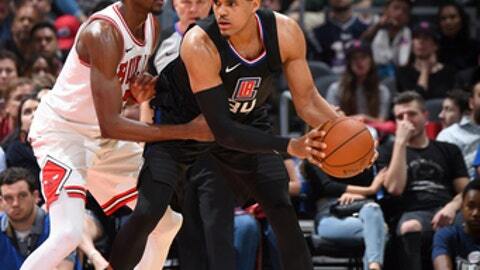 But when the game began Saturday, the new and the old melded like they’d been at it for some time, newcomer Tobias Harris blending with holdover Danilo Gallinari to lead the Clippers to a 113-103 victory over the struggling Chicago Bulls. Harris and Gallinari each scored 24 points in their first game together, and the Clippers stayed with a simple motion offense that led to a season-high 33 fast-break points. ”Tobias and Danilo were phenomenal tonight,” said Clippers coach Doc Rivers. ”I’m just trying to figure out what we have with those two. Harris, Avery Bradley and Boban Marjanovic came to the Clippers on Monday in the trade that sent Blake Griffin to Detroit. Griffin also scored 24 in his debut for the Pistons. It was the sixth consecutive loss for the Bulls, who also made a trade on Tuesday. Their three new players, however, had yet to take their physicals and did not play Saturday. The Bulls also played without starters Kris Dunn and Lauri Markkanen. Zach LaVine had 21 points and nine rebounds and led six Bulls players scoring in double figures. The Clippers led the entire game but were never able to put away the Bulls, who started the game by missing their first seven field goals and finished shooting 36 percent. Harris was 10 for 19 from the field, beginning his Clippers career by hitting a 3-pointer for the first points of the game. He played 34 minutes in his debut. Bulls: Coach Fred Hoiberg said newly acquired Omer Asik, Jameer Nelson and Tony Allen did not suit up because they had yet to take their physicals. … Sent an assistant trainer to Chicago to check on the progress of G Dunn (concussion). Said Hoiberg: ”He’s still on the concussion protocol. As he continues to feel better, hopefully he can cross off the steps to get out of it. Then he’ll need a couple of practices before he’s cleared.” … Markkanen remained home for the birth of his first child but Hoiberg said he may rejoin the team for their next game in Sacramento. Clippers: Doc Rivers said G Austin Rivers (right ankle) should return when the team starts to play seven consecutive road games on Feb. 9. He’s missed 17 games with what was originally called a strained Achilles tendon. Since their new players only new a couple of basic sets, the Clippers went to a slashing, running style of play that proved effective. ”We played with a new team today,” Gallinari said. ”The style is going to be what you saw today. We just have to keep it up and keep improving. It can get better. Bradley also started, finishing with eight points, five rebounds and five assists. Bulls: At Sacramento on Monday night to close a three-game trip. Clippers: Host Dallas on Monday night.